Thanks to an Open Public Records Act request submitted by Salem County resident Katie Coleman forwarded to The Bob & Steve Show we can now confirm Salem County Sheriff candidate Robert Gant was indeed terminated “as a Corrections Officer within the Salem County Jail. No matter how one reads this document the facts are clear, Gant assaulted an inmate and worked with others to cover it up and even attempted to intimidate another officer into sticking with the story (page 6 of the document). One can argue over exactly how big a “knucklehead” a 19-year-old Mills was, but one cannot argue that he deserved to be beaten to the point of unconsciousness. The facts are The Bob & Steve Show did not provide “fake news” and Gant was what one would consider a bad cop back in the day. Democratic Sheriff Candidate’s Campaign Sign Spotted Near Confederate Battle Flag. Same Candidate Was Once Accused Of Beating Black Inmate. Just when I thought I was done writing about the Salem County Sheriff race, a Gant for Sheriff sign is spotted only feet away from the Battle Flag of the Army of Northern Virginia. 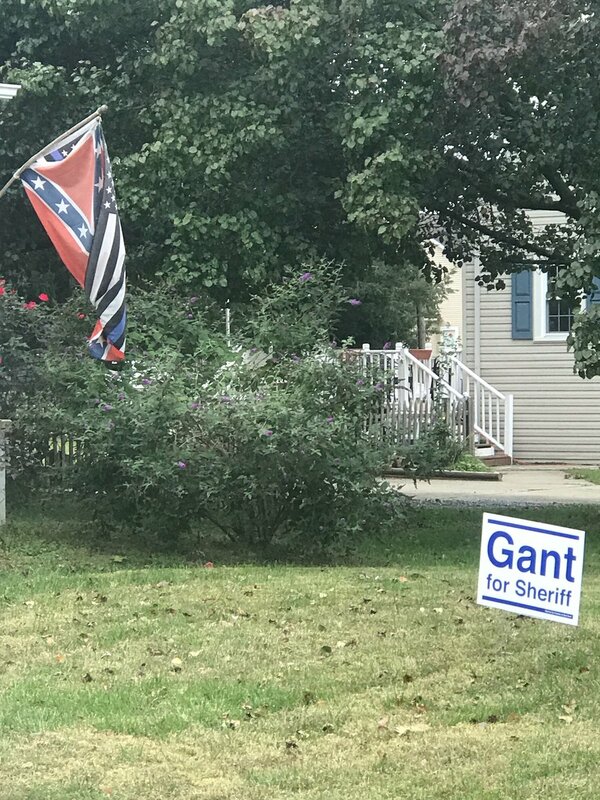 As you can see in the photo the Gant for Sheriff sign and the Battle Flag of the Army of Northern Virginia are proudly displayed on a well-kept property. The property happens to be in the same town in which Gant lives. I get it, Gant supporters are going to argue that he didn’t put the sign near that flag. But could you imagine if it were a Republican candidate’s sign near that flag? It would be national news! This is interesting because, as regular readers of The Bob & Steve Show blog know, it was a post on social media by a guy named Walter Hudson, who obviously doesn’t like cops, that led to some digging into the background of Democratic sheriff candidate Bob Gant. That digging led to my interview of Bunyan Mills. Mills did not hesitate when I asked if the rumor he was assaulted by Gant was true. He quickly said, “yes.” Mills said Gant beat him unconscious. I spent a total of 29 minutes and 26 seconds on the phone with Mills. I believe him. If I didn’t believe him I would have never written the piece nor would I have invited him on our radio show. Unfortunately, I was in the hospital for last week’s show, so he didn’t call. If Mills calls in tomorrow you will hear the sincerity in his voice, just as I did. In our last post about the Salem County Sheriff election readers were provided with a court document that clearly states Gant agreed not to seek re-employment with the County. I am not saying it proves Mills was beaten unconscious by Gant, but I am saying that at the very least it demonstrates Gant was no angel. Maybe, just maybe, Walter Hudson was onto something when he wrote, “Over the years Gant have not been fair to black people.” Even a blind squirrel finds a nut once in a while. It’s now up to Salem County voters to decide. When I last wrote about the Salem County Sheriff race some supporters of Bob Gant were mad at me. I still don’t understand how people could be mad that I believe that a lieutenant in the Sheriff’s Department who wants to be sheriff might actually go to work. That anger led me to do some digging, even my co-host Bob drove an hour to run down a lead for me. Thanks Bob! It got me thinking, who is Bunny Mills? It turns out his name is Bunyan Mills, he no longer lives in New Jersey, he works as a union electrician, coaches youth football and has a kid in college. Even better, I was able to track down a phone number for Mr. Mills and he answered on the third ring. I spent 29 minutes and 26 seconds on the phone with him last night. Mills is a nice guy who acknowledges he did something wrong when he was very young, it had to do with drugs if you must know. Mills told me that mistake set him on the straight and narrow. I asked Mills if the rumor that Gant assaulted him in the Salem County Jail was true, the answer was an immediate yes. I explained to Mills that I understood this might be difficult to talk about and he didn’t have to if he didn’t want to and he quickly agreed to give me details. Mills explained he was in the holding cell with “a lot of other guys” and there was an elderly man by the last name Parsons, now deceased. Apparently, Parsons was ill and Mills called for a Corrections Officer (CO). Mills said, “The CO brushed me off” and admits, “I had some choice words,” for the CO brushing him off. Mills explained that as inmates were being transferred to cells or “the pods,” he was one of the last ones to get the paperwork done. He explained the process of how inmates turn around with their backs facing COs to be handcuffed. Gant, and his supporters have, publicly denied this happened. Fortunately, I have a lot of friends who are lawyers, call it an occupational hazard. What that means is I have access to, well friends with access to all kinds of legal records. And that means I can find the truth! Don’t believe me, I was once charged criminally for releasing expunged records that somehow ended up on my doorstep, fortunately I didn’t know the records were expunged and the case was dismissed. My point, the story was true and I told it. So, if you still doubt Gant beat a handcuffed, defenseless man unconscious with a weapon I do know Salem County imposed major discipline and terminated Gant's employment. 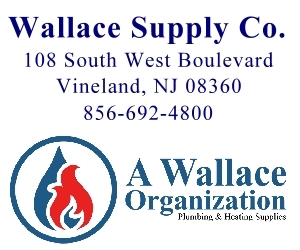 I know because he appealed to the New Jersey Office of Administrative Law (Docket No. : CSV5577-91) and lost. I know he lost because Gant appealed to the Appellate Division, N.J. Superior Court (Docket No. : A-4025-91 T2). I’m assuming the County got tired of the constant appeals and obviously rehired Gant as a Sheriff's Officer and not a Corrections Officer. There must be a reason why Gant only does courthouse security, serves warrants, writs and court process. Is it possible they think he can’t be trusted around handcuffed, defenseless inmates? I’m going to continue digging into candidate Gant for the memory of my stepfather who was a good, dedicated cop and for all the good cops still on the job because guys like Gant, who are willing to beat defenseless men unconscious, are the ones who create cop haters like Walter Hudson and make life difficult for every good cop out there. And, as a special bonus to this post, Bunyan Mills has agreed to call in to The Bob & Steve Show at 8:10AM tomorrow and tell his story.